Can I Get a Tweet For My New Book? I love writing, but I’m not crazy about marketing my own work so I could use your help. 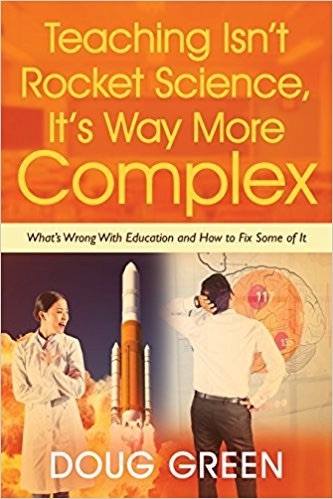 If you like the Internet resources and book summaries I post, please consider sending out a tweet to promote my new book Teaching Isn’t Rocket Science, It’s Way More Complex: What’s Wrong With Education and How to Fix Some of It. In it, I take on the current reforms and their one-size-fits-all test-based accountability and standards. A lot of what is happening is bad for students and demoralizing for teachers and with your help, we can work to make things better. Bad tests promote bad teaching and the students who suffer the most are usually those who need personalized instruction the most. We need more arts and exercise, not less. We need to give kids the help they need when they need it and expose all students to exciting hands-on, real-world, lessons and projects. We need to foster creativity and collaboration as we work on forming strong relationships. This is advice from someone who has been in this business since 1969 and who tries to live outside the box. If you are part of this fight, my book is full of ammunition. Thanks for all you do and I’ll see you tomorrow with more free resources. Click here to buy at Amazon. Scroll down for a summary and please share. Teaching is tricky business. If it were as easy as rocket science, which we seem to have figured out, all students would be learning as fast as their individual brains would allow. This implies that they would learn at their own individual pace, which would cause the gaps between the faster learners and the slower learners to gradually increase. Unfortunately, our current set of reforms driven by the corporate/ political complex gives the same tests to students each year based on their born on date, regardless of their ability. It also expects teachers to close the gaps between slow and fast learners. One way to do this is to slow down the fast learners. In this book, Dr. Green explains why the current reforms and out-dated teaching methods need to go and just where we might head. It’s clear that we understand how rockets work as we have sent them all around the solar system and beyond. The human brain, however, which is the learning playground for students and teachers is much more complex and less understood. Promising ideas in education spread slowly, if at all, because of a resistance to change and federally imposed standardized testing. Thanks to the media, however, the public doesn’t realize this and they think that teachers are generally doing a bad job. They also think that all students should be able to achieve at high levels, which is nonsense. We all know that some students are more capable at cognitive tasks than others. When the government encouraged by business leaders imposes high-states tests on schools, three things can happen. First, some will cheat and many have. Second, most will try to game the system with endless test prep that brings with it a lot of bad teaching practice. Finally, some will just fail. Schools will be closed and careers will be negatively impacted or ended altogether. This chapter documents some of the cheating and explains the different ways that teachers can cheat. It also suggests that teachers work to create engaging lessons and let the tests take care of themselves. If they do, test scores are unlikely to go down and just might go up. 4. Are You Smarter Than Bill Gates? Bill isn’t the only member of the corporate class pushing for test-based accountability, he is just the most famous and has the most wealth to push his ideas. Dr. Green suspects that when Bill wants to cure some disease, he reaches out to experts in the field. When it comes to education, it seems that he thinks he already knows the answers. Meanwhile, it’s hard to find any real expert in the field who thinks the current reforms are a good idea. Unlike businesses, schools cannot control their raw materials. They just take the students that their parents drop off. Most are also run from the top by a school board composed of elected volunteers who for the most part lack any serious educational expertise. For these reasons, trying to hold schools to business standards makes no sense. It also makes no sense to hold all schools to the same standard as their raw materials vary. When advocates for blacks, Hispanics, and poor kids see that that whites and Asians perform better on standardized tests, they expect schools to work on closing the gaps. Ironically, if schools did a perfect job of letting every student learn as fast as possible, the gaps would increase. Doug maintains that the best way to close the gaps is to slow down the fast learners, which some schools do well. He also points out that the subgroups themselves are arbitrary and don’t make much sense. For example, why are Spanish speakers the only group based on the language they speak when more people speak English and Chinese? People from China and India are very different in appearance and culture, yet they are in the same group. This entry was posted on Friday, January 26th, 2018 at 7:46 am	and is filed under Doug's Original Work. You can follow any responses to this entry through the RSS 2.0 feed. You can leave a response, or trackback from your own site.